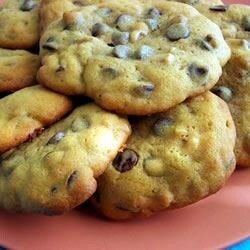 "Now this is a real good chocolate chip cookie! It's the real thing!" In a medium bowl, cream together the butter, white sugar and brown sugar until smooth. Beat in the egg, then stir in the vanilla. Combine the flour and baking soda, stir into the creamed mixture. Fold in the chocolate chips and walnuts. Drop by rounded ice cream scoops onto a cookie sheet, and press down slightly to flatten. Cookies should be about 2 inches apart. Bake for 11 to 14 minutes in the preheated oven. Allow cookies to cool on baking sheet for 5 minutes before removing to a wire rack to cool completely. This recipie was Alright at best...they had a nice flavour but they came out very flattened...I wouldnt make them again, and I wouldnt recomend them. These cookies were very yummie. They turn out chewy and soft. I will be making these again. Did not like. This cookie is brittle and not sweet.